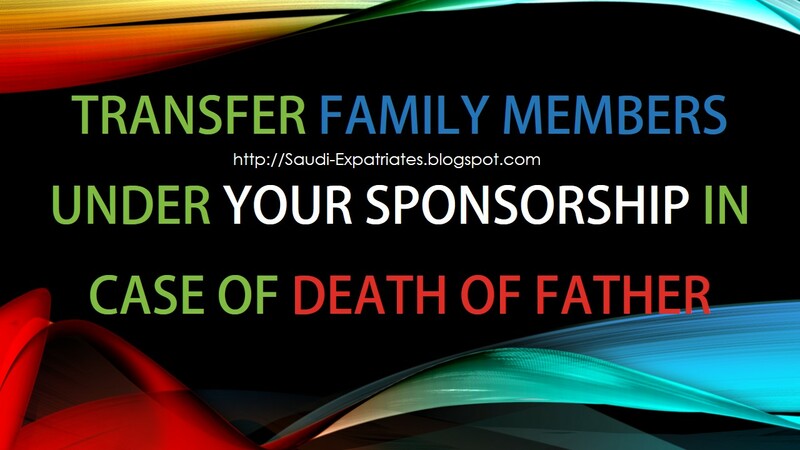 Procedure to transfer your family members under your sponsorship in case of death of the father or head of the family. These procedure is applicable only if the son is working under another sponsor or company in the kingdom of Saudi Arabia. This process does not cost anything. 1. A copy of your passport and valid Iqama with eligible profession. 2. A copy of your birth certificate, translated in Arabic. 3. A letter in Arabic explaining the reason why you are transferring your mother and siblings under your sponsorship. 4. NOC and salary certificate from your employer attested by chamber of commerce. 5. GOSI (General Organisation of Social Insurance) certificate mentioning your salary same as in your salary certificate. 6. A copy of death certificate of your father. 7. A copy of your father Iqama and passport. 8. A copy of your mother Iqama and passport. 1. A copy of your brother Iqama and passport. 2. A Copy of birth certificate of your brother, Translated in Arabic. 3. A Confirmation letter from School of your brother stamped by school and Ministry of Education. 1. A copy of your sister Iqama and passport. 2. A copy of birth certificate of your sister, Translated in Arabic. 3. An Arabic confirmation letter from you mentioning your sister is still unmarried. Submit all above mentioned documents to Legal Affairs Department of Jawazat Saudi. Once they verify your documents, they will return your documents and will issue a letter to you addressing to court to issue a verification letter. 1. Original valid iqama's and its copies of all family members including yours. 2. A letter from Saudi Jawazat, which you got in above procedure. 3. Your known 4 witnesses, who should witness that your head of family is no more and you are the only one legal guardian available to take care of your family. Visit the court and let your case register then wait for your turn to go to Judge along with witnesses. State the situation you faced provide your witnesses, If you are unfamiliar with Arabic they will arrange a translator. Once judge satisfied, He will provide a paper to sign along with witnesses, then he will issue your (صك اعالة) verification letter. Now visit again to Legal Affairs Departement of Jawazat and submit all of your documents including verification letter from court. Saudi Jawazat people will write a case and ask you to visit after some days. Once they approved they will issue a letter to proceed with transfer. 1. Fill the transfer form of each and every family member. 2. Valid original Iqama's and passport copies of each and every family member. 3. Recent passport size photographs of each and every family member. 4. Enroll finger prints of all family members in fingerprint enrollment department, if not done earlier. Submit this all documents to Transfer of Service Department of Jawazat including a letter of Legal Affairs Department. Transfer of Service Department will transfer all your family members under your dependents. You will get a SMS once transferred, You can also check in MOI Absher sponsor services. In case of mother having profession in that case transfer of sponsorship is it possible ?